$20 off $100 running shoes on Amazon! Amazon has a $20 off $100 running shoes sale going on right now. The sale is good for both men’s and women’s shoes and they have loads of brands and styles to choose from. The promo code to remember when you’re checking out is RUNSHOES. Enjoy! P.S. Yes I still have a job. P.P.S. No I won’t have it for much longer if I continue to send the day shopping, watching YouTube videos and blogging. So Andi, my buddy for at least the last 25 years, got me some sweet running stuff for Christmas. Running treats – delicious. Foam roller – where have you been all of my life? Running lights – perfecto! Running belt (however) – just not my deal. I have a totally genius and practical and fashionable mindset that is something along the lines of if it doesn’t fit in my bra, I don’t need to bring it with me. I do have a water belt that’s an exception to this rule and while I definitely enjoy avoiding dehydration and all the perks that come along with this I hate the damn water belt. I gave the belt some serious, thoughtful consideration. I honestly did. (It is February after all, and I got the belt for Christmas.) However, in the end I just couldn’t take the plunge. Sorry Andi. Anyway, on Saturday I decided to trot on down to the Running Room and exchange the belt for a new pair of running shorts or something to this effect that would get much more use over the year(s). But, as I looked around, there really wasn’t anything that jumped out at me, nothing really caught my eye. (Let me emphasize how totally freaking strange this felt!) Of course I then diverged from the task at hand and wandered over to the oh-so-tempting wall of shoes. As I began drooling over the new Mizuno Wave Creations I heard the fateful words, “Do you have any of last year’s model on sale?” creep out of my mouth. What the…? I totally don’t need new shoes! (By my standard anyway.) My current pair of WCs are just entering midlife and my Wave Elixers only have one run on them! But of course, as luck would have it they did have last year’s WCs on sale…in my size…and for $49!! OMG! These would be a strong contender for the cheapest Wave Creations known to man! AND I had just about half of that covered by my Andi’s belt! I might as well have stolen them right off the shelf! The rest is history of course. I bought the shoes before anyone could second guess the price sticker (along with a Margarita Clif Shot Blok for the marathon) and took off like a mad woman! 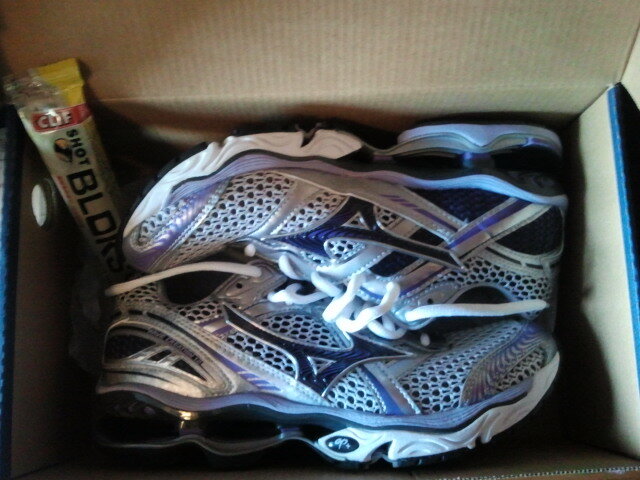 So Andi, thank you so much for the running treats, lights, foam roller and my absolute favorite pair of running shoes!